CHICAGO (AP) — Bears coach Matt Nagy decided to rest his starters for the next-to-last preseason game rather than use it as the customary regular-season tuneup. And the backups proved that they're also ready for the regular season. 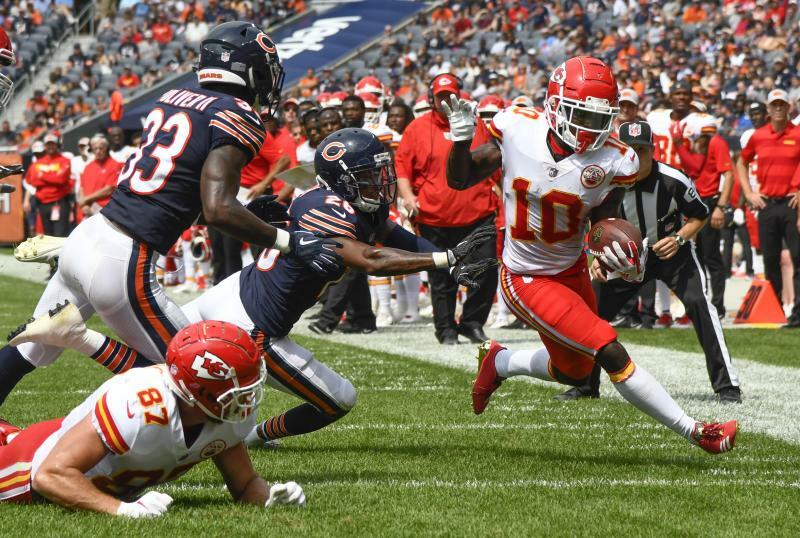 Backup quarterback Chase Daniel directed touchdown drives on the first three possessions and the Bears defeated the Kansas City Chiefs 27-20 on Saturday. "It's a confidence builder, for sure," Daniel said. The Bears played in the Hall of Fame Game and have been practicing since July 20, and Nagy liked what he'd seen in practices. So he decided Friday to keep starters out of what normally would be a dress rehearsal for the regular-season opener at Green Bay on Sept. 9. "This was, for me, more of just knowing the pulse of our team," Nagy said. "I know this team better than anybody right now." Daniel replaced Mitchell Trubisky against the Chiefs, the team Nagy last year served as offensive coordinator. Nagy didn't think Trubisky, who is in his second year as a starter, would have benefited greatly after about 2,000 preseason and training camp snaps. "We've had some grueling practices against Denver, some live reps in our past couple preseason games," Nagy said. Playing against Chiefs defensive starters and then the backups, Daniel led the Bears to a 24-10 halftime lead. Daniel, a Chiefs backup quarterback from 2013-15, finished 15 of 18 for 198 yards and two touchdowns. The first two Bears touchdown drives came against Kansas City's starting defense, minus injured safety Eric Berry and four other injured players. "I felt like I was seeing it pretty good out there today," Daniel said. Wide-open receiver Kevin White caught Daniel's 29-yard TD pass in the first quarter to break a 7-7 tie, and Daniel then found Javon Wims for a 7-yard TD pass in the back corner of the end zone and a 21-10 lead. Benny Cunningham ran in from 13 yards for Chicago's first TD and Cody Parkey added a 48-yard field goal just before halftime. 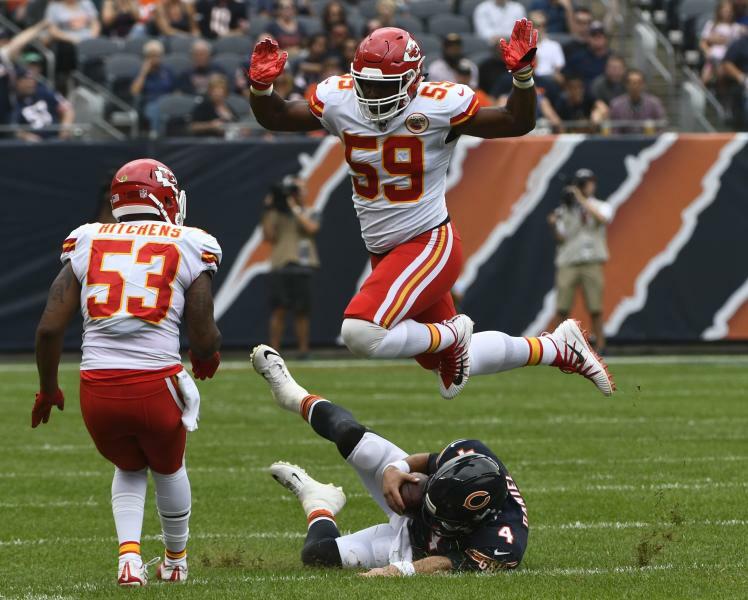 Chiefs quarterback Patrick Mahomes II and the starting offense played into the third quarter against the backup Bears defense, and showed inconsistency. Mahomes flipped a short pass to the right side and Kareem Hunt turned it into a 19-yard TD for a 7-7 tie. Then he led a 49-yard drive ending in Harrison Butker's second-quarter 47-yard field goal. Mahomes didn't produce a big play on Saturday, and finished 18 of 24 for 196 yards. He left the game with the Chiefs down 24-10 in the third quarter. "For me, I thought today was a good day as far as taking what was there and at the same time attacking the defense," Mahomes said. The Chiefs had eight penalties for 85 yards and a third-quarter drive ended at the Chicago 5-yard line. "We can learn from this offensively," Chiefs coach Andy Reid said. "You're in the red zone you have to put points on the board. You can't have penalties. We had way too many penalties. Special teams, offense and defense, and tackling we have to make sure we work on that. "Again, that's what the preseason is for." 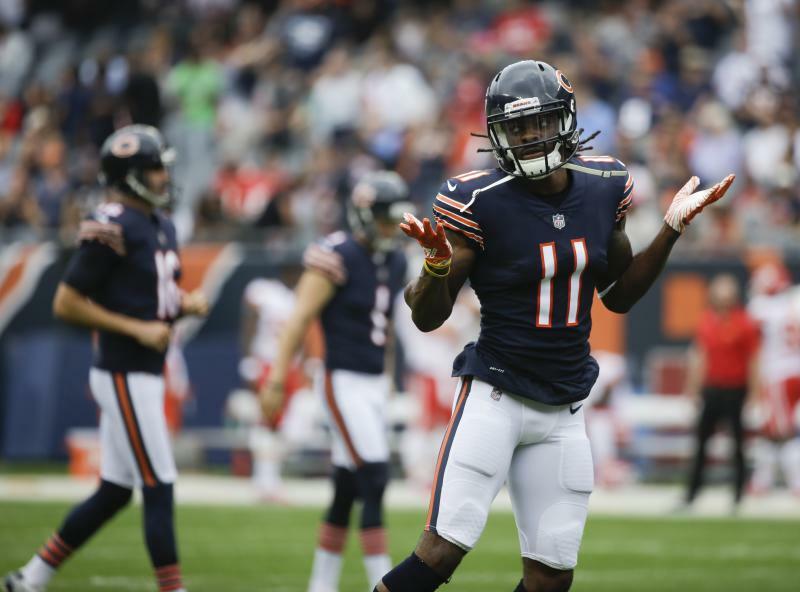 Bears wide receiver Kevin White's 29-yard touchdown catch in the first quarter was the first touchdown he has scored since coming into the NFL as the seventh pick in the 2015 draft. White missed 2015 and much of 2016 with leg injuries, and played one game last year before suffering a shoulder injury. He is vying for a roster spot in a crowded wide receiver competition and has Nagy's eye. "I root for underdogs, I love underdogs," Nagy said. "And so when you have an underdog that fights his tail off to improve and when people don't believe in him and he proves the people who do believe in him right, then there's nothing better to me." Nagy and his mentor, Reid, shared a hug and a few moments after the game. Nagy also had a long talk after the game with Mahomes, who started a game for the Chiefs last year as a rookie. "I told him good luck," Mahomes said. "He was someone that I really got to know last year and really built a great relationship with him. I'm excited for him and his future with Chicago." Chiefs linebacker Tanoh Kpassagnon was flagged for roughing Daniel in the second quarter, even though Daniel was tackled with the ball still in his hand. Daniel said it was because Kpassagnon drove him into the ground with the full force of his body. "I got crushed," Daniel said. "I'm glad I was wearing full pads out there." Green Bay quarterback Aaron Rodgers last year suffered a broken collarbone on a similar hit. There were no protests during the anthem. Bears wide receiver Marlon Brown left in the second quarter with a possible concussion and did not return. ... Bears reserve tackle Bradley Sowell was assisted from the field in the fourth quarter with a leg injury. Chiefs: Close the preseason Thursday by hosting the Green Bay Packers. Bears: Close the preseason Thursday by hosting the Buffalo Bills.